This new showerhead is created using the popular Rainshower Icon series. This trademark design features a halo shower head and a coloured spray face. The shower head is now enhanced by a petal-shaped bumper surrounding the shower head. Like I said earlier, Flower Power is back! All Rainshower Flower Collection models share GROHE Dreamspray technology and GROHE Starlight chrome finish, ensuring they will retain their sheen for years to come. The best part about the showerhead is its unique appearance. The boys are totally in love with using it. This should make difficult bath sessions more enjoyable especially if you have picky little ones who refuse to bathe. The Flower collection comes in 6 different blooms. Choose from the sunny orange and yellow 'SunFlower' , the cheery red and yellow 'Tulip', the sweet pink and purple 'Lily' or the lovely white and yellow 'Daisy'. The white and blue ' Bluebell' and the white and pink ' Orchid' will be excellent choice for a unique baby shower gift for a baby boy or girl respectively. With a wide array of choices, it should be easy to find a Flower to fit your bathroom decor. Don't worry if the little ones grow out of it. The flower bumper can be easily remove to resemble the Rainshower Icon series. 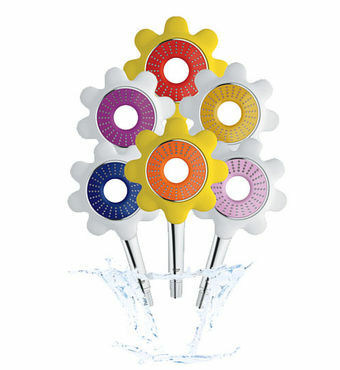 GROHE Rainshower Flower a Collection is now available at retail price of Sgd 177 at authorized GROHE outlet.